Home grown cabaret show Glamourpuss was a great success at Fringe World now the producers behind the production are hoping to take the show interstate and around the world. Glamourpuss, produced and performed by Perth Cabaret Collective, wowed audiences at Fringe World 2019 and scooped a Weekly Award for Best Cabaret Show. This is the fifth consecutive year Perth’s home grown cabaret troupe has participated in Fringe World, winning or nominated for an award every year. This year over 1,350 Fringe World tickets were sold to Glamourpuss, a Vegas-style show with a heady mix of 1950s big band jazz, sassy show girl glamour and plenty of “Rat Pack” repertoire. Glamourpuss is one show in Perth Cabaret Collective’s repertoire. The collective was founded by WAAPA graduates Jessica Herbert, musical director and Jessica Gough, producer and choreographer. Both are teachers and mentors in their art form and are actively involved in the arts community. Herbert is a Manager at the WA Youth Jazz Orchestra, teaches at the University of West Australia, plays saxophone in Oz Big Band, Perth Saxophone Rockers and Reece Clark and Friends and is a dedicated saxophone tutor, running courses for young musicians at UWA. “We are committed to represent Perth at festivals around Australia and we’re committed bringing culture and arts to regional communities,” Herbert said in a media release. Jessica Gough’s passion for cabaret, vintage and contemporary dance styles has taken her across the globe performing and producing. Also known as The Sugar Duchess, Gough is the Director of the Perth International Burlesque Festival, Production Manager for the Australian Burlesque Festival, part of the Management team for the Australian Burlesque Museum, and Events Manager, Performer and Teacher for Sugar Blue Burlesque. “Being invited to perform at the Melbourne Cabaret Festival will help to showcase the enormous cabaret talent we have here in Perth, and we hope it will educated and garner community support for cabaret with a whole heap of fabulous flair and fun at the same time,” Gough said. Herbert said that sending 16 people to Melbourne to perform is a dream come true but a challenge for their ‘struggling artist’ budget. A Go Fund Me page has been set up to assist the troupe and their goal is to raise $12,000. “We’ve had so much positive feedback from our show at Fringe World and people have generously donated to our Go Fund Me page to help and we are so very grateful for their support,” said Jessica Herbert, who plays baritone saxophone in the band. 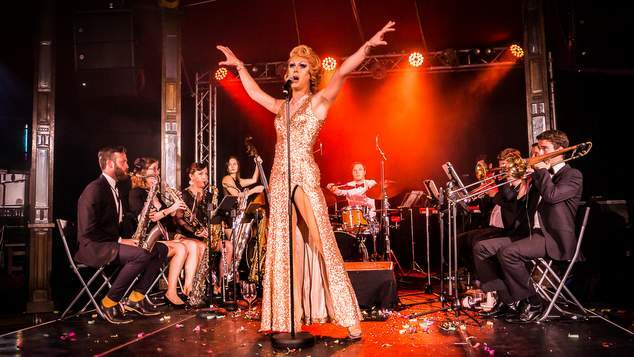 Perth Cabaret Collective is Western Australia’s most successful cabaret troupe taking out Fringe World awards every year since 2015 including ‘Best WA Cabaret’ four times.